Bernard Gene “Bernie” Poncin, 86, died at his home on September 12, 2018. He was born to Joseph and Catherine Poncin on May 22, 1932 on their family farm in Raymond, KS. He was a longtime Lyons resident and retired plant operator for Enron in 1993. He was an honorable and proud member of many organizations. He was of the Christian faith. His highest accomplishments was being a 32* Master Mason. 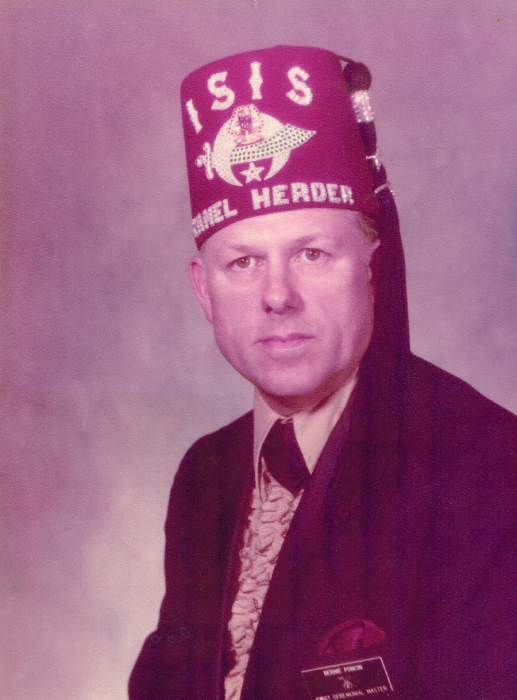 He joined the Shriners organization November 1965 and became a lifetime member in 1976. He received his 50 year membership pin in 2015. Bernie served in the United States Army Reserves. On July 17, 1955, he married Florence Mary Reinke in Ellinwood. Our valiant hero was preceded in death by Florence, the love of his life, and his bride for 62 years, on July 20, 2017. His proud legacy survivors include Jalayne and Michael Wheatley, Leonardtown, MD, Marlyn and Diane Poncin, Great Bend, KS, Michael Poncin, Folsom, CA, Jalynda and Martin Cervantes, Kansas City, KS; 12 grandchildren and 9 great-grandchildren. Graveside service with masonic rites will be 1:00 P.M., Tuesday, September 18, 2018 at Lakin Comanche Cemetery, Ellinwood, with Pastor Aaron Withrow officiating. There will be a private family viewing at Birzer Funeral Home, Lyons, KS. In lieu of flowers, memorials to the ISIS Shrine Temple, Crippled Children’s Fund, in care of the family or Birzer Funeral Home, Lyons.